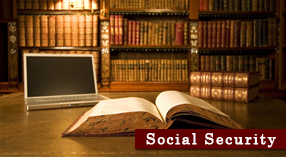 If you feel you are disabled so severely that it prevents you from working, you'll need an experienced Social Security | Disability Law Attorney to fight for you. Attorney, David Strange has fought and won cases for hundreds of people throughout the Vermont & New Hampshire and is ready to help you understand your rights and responsibilities while providing you with the best possible representation. Social security is designed to protect individuals from unforeseen catastrophes. The United States Social Security Program was created in 1935 to provide the elderly, disabled, and survivors of deceased family members with retirement & disability insurance benefits to workers and their families. Unlike welfare, social security benefits are paid to an individual or his or her family members in an amount based on the retired, injured, disabled or deceased person's employment record and prior contributions to the system. The program is administered by the Social Security Administration (SSA). To obtain these benefits, an applicant must submit the proper forms and wait for approval, quite often being denied after the initial application, having to submit their claim a second time and experience a waiting period most people can't afford. Attorney, David Strange is familiar with and experienced in processing these types of claims on his client's behalf to help them obtain the benefits they're entitled to. Our client pays nothing for representation unless we win, therefore the ultimate goal is to help clients obtain the benefits they are entitled to so that we both get paid. Attorney, David Strange has the experience and knowledge to help his clients obtain the benefits they're entitled to. During the initial consultation, he'll evaluate your situation, if he feels he can help you with your particular case, he'll explain the process, file the necessary paperwork on your behalf and go to court to ensure that your rights are protected and will work hard to help you win. Call 1-603-823-9030 today to schedule a free, confidential consultation. We'll be happy to help you claim the benefits you deserve! Call 1-603-823-9030 to schedule a confidential consultation to determine if you are entitled to compensation. For your convenience, services are available on a contingency basis. Monday – Friday, 9 a.m. to 5 p.m.